I’ve been back to Ausin a few times since then (my sister lives there), and since this trip was long (two weeks), we had plenty of time to do some things we haven’t before. One of them was visiting a hole in the wall on Sixth called THE JACKALOPE, which was voted 4th best on the street by Thrillist. and whose Chipotle Bacon Cheeseburger was featured on the Food Network’s Best. Burger. Ever. A neat little place to hang out—here’s a couple of pix from our visit. Better yet, plan a visit for yourself and check it out at http://www.jackalopebar.com/. If you can’t get there soon, watch the video to get a feel for the joint! The bar’s sign on Sixth Street. I’d never heard of this place until we went to Voodoo Donut the Sunday before. The artwork in here is tremendously fun. This is just about the coolest man-cave lamp! The cover of the menu. I had my heart set on trying this burger when I first looked at their menu online. I loved the Ace Pear Draft. I took a picture so I’d remember it and look around for it up north. 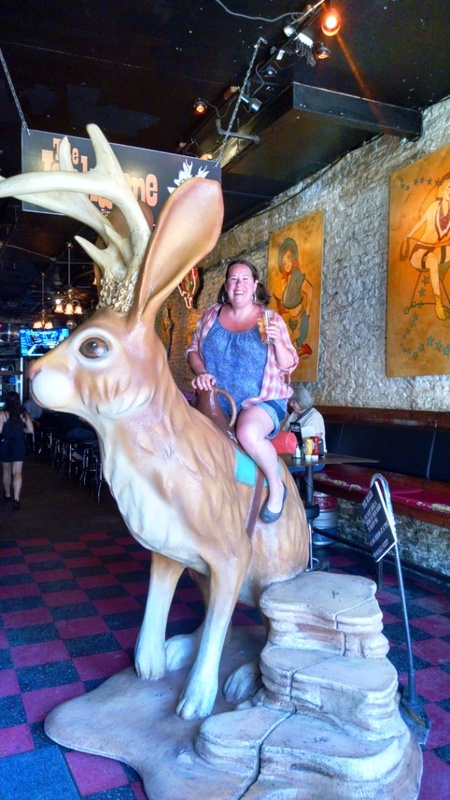 You cannot “mount” the Jackalope without a drink in your hand. It’s Noon somewhere. Missie had their pizza and said it was excellent. That’s no small feat for those of us who grew up an hour or so out of NYC. Posted on May 23, 2016, in Deep Thoughts & Fun Stuff, Short Stories and tagged Food Network Best Ever, good burgers in Austin, horror stories set in Texas, jackalope, John Palisano, the Jackalope Bar & Grill, Unnatural Tales of the Jackalope. Bookmark the permalink. Leave a comment.